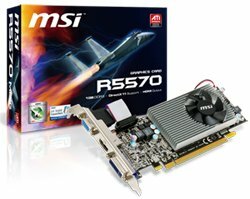 World-leading graphics card and motherboard manufacturer, MSI, is launching today R5570-MD1G graphics card in low-profile design to meet the demands of home theatre personal computer (HTPC) users. Powered by ATI RadeonTM HD 5570 GPU supporting DirectX 11 and Dolby 7.1 channels loss-less surround stereo and equipped with HDMI output for Full HD movie playback, MSI R5570-MD1G is featured with the compact size benefited from the low-profile design, making the product the best-ever choice for building any HTPC. The brand new MSI R5570-MD1G features as low-profile design to fit the HTPC conventionally with limited space, especially for smaller or slim cases. On the other hand, the low-profile design is good for thermal dissipation to facilitate interior air ventilation. Ultimately, the mini size of R5570-MD1G makes installation much easier and more convenient. R5570-MD1G is smaller than ordinary graphics cards, but MSI never cuts corners. To the contrary, MSI adopts all solid capacitors onboard to extend product life and increase the temperature tolerance of R5570-MD1G to prevent capacitor explosion and thereby enhance system stability and reliability. In addition to the standard video outputs, DVI and D-sub, R5570-MD1G is equipped with the increasingly popular HDMI output that can deliver both digital video and audio signals at the same time to minimize the usage of cables and facilitate consumers to connect to various A/V equipments. Furthermore, R5570-MD1G is featured by genuine Dolby 7.1 channels loss-less HD audio output for consumers to experience perfect “live” sound effects while enjoying an HD movie or playing 3D games.